Light swivels to any angle. Base is black, not silver as pictured. There are too many needs for an outdoor spotlight to list. Putting on an outdoor production of Hamlet? You have to have a spotlight. Raccoons raiding your trash? They’ll appreciate a spotlight so they can see your trash better. Spent hours and hours setting up the best decorations in the neighborhood, only to have them neglected by passersby because they can’t see them? Oh, you better believe you need a spotlight! 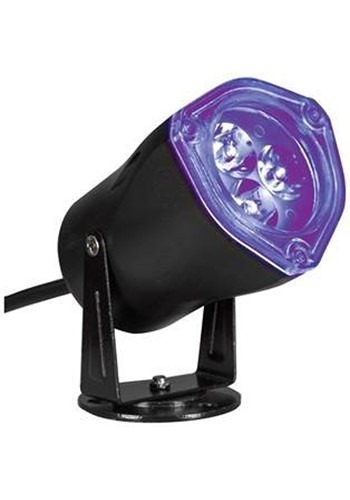 Our LED Black Outdoor Spotlight is even better than your run-of-the-mill light because it uses blacklight, popularized by hippies and crime scene investigators, to bathe your decorations in a haunting, alien glow. Blacklight makes colors really pop and stand out, so your awesome props will look even awesomer than ever before. And installation is a breeze thanks to the handy stake at the base of the light. Just stick it and stroll!